No, the word ‘Ivory’ does not stand for its brand, neither is it a new line of cellphones. In fact, it is actually made from some really tough hair which is better known as ivory, hence it’s namesake. 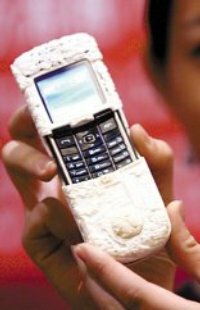 The luxury cellphone was designed in the bowels of Guangzhou, China, where the street culture permits all sorts of exotic fanfare such as monkey brains and dog soup, making something as unsavory as an Ivory cellphone look pretty ordinary. This unique handset is not only made from an elephant’s teeth, it also contains a healthy mixture of mammoth and camel bones. We all know that mammoths have long been extinct and the availability of a well-preserved sample is extremely low, thus the inclusion of such a rare material is reflected in its final price tag. The Ivory cellphone comes engraved with 16 magnificent dragons (did you expect St. George on it? ), as well as other artistic carvings that help the owner own a technological piece of art which reflects the spirit of Guangzhou. There will only be half a dozen of such Ivory cellphones made (probably due to the lack of mammoth bones), and you will be able to be a proud owner of one for a jaw-dropping $23,000. I guess it will only be a matter of time before some poachers off the Serengeti plains will ramp up their rhino efforts in order to bring you yet another Ivory cellphone. Definitely not the handset for animal activists. Details regarding the features are as scant as the number of Ivory cellphones available. Ivory is in no way hair. The only thing Ivory has in common with hair, is that they are both non-living structures that grow from the body. Whoever you are, you are a moron. Please stop polluting our internet.